Visual World was built on the principles of what we call “The Well-Formed Business Process” (WFBP). This process was the result of some very deep thinking around the application of technology to business process. In The WFBP methodology, all business processes deliver value to a requesting entity. That value is created through a series of value-added process steps that apply or employ the intellectual and physical assets of the company. A “requestor” is the entity to which value is being delivered. A requestor may be an external customer, a department within an enterprise, or even another business process within the company. In any case, all business processes have a requestor and the goal of every business process is to deliver value to that requestor. The “work” of a business process is generally tracked by a “form” of some sort (Sales Order, Purchase Order, Trouble Ticket, etc.) Forms track an instance of work as it progresses through the steps of a business process. The steps of a business process are what Visual World calls “value-added activities” (VAAs). 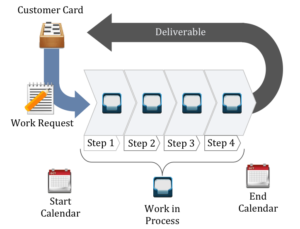 Visual World organizes the “work” of a business process into these value-added steps, which may be performed by a person or a piece of automation. Forms flow through the VAAs of the business processes based on your business rules. These process steps bring the work to the person responsible for their value-add and provide all the information required to perform the activity. A VAA is really a combination of a business rule to “attract” the work, the object of the work (a form), a description of what to do, and in most cases the application or assignment of company assets.The WFBP has proven itself in a variety of industries and applications, and for the past 10 years, in the Wine & Spirits industry as well.